Click the button below to add the POWER PANDA! Girls Gymnastics Leotard: Cute Panda Black and White - FREE SHIPPING and Free Scrunchie! to your wish list. Power Panda is quickly becoming one of our most popular leos. This adorable, cuddly, super-leotard is guaranteed to turn heads at the gym and on the podium. Charming panda eyes set against white mystique fabric give this one-of-a-kind gymnastics leotard its unique, eye-catching look. This darling leotard is soft yet sturdy, and is designed to meet the highest quality and performance standards. Each leotard provides exceptional comfort and durability. Every genuine Power Panda girls gymnastics leotard is hand-sewn in the USA from the finest tricot fabric and mystique nylon with spandex 4-way stretch material. Tricot fabric has a unique weave that allows it to be smooth on one side and textured on the other. The attention-grabbing design of this playful leotard will give your gymnast's workouts an unbeatable combination of fun, comfort and style. Makes a wonderful gift. 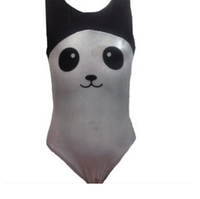 Order your new Power Panda gymnastics leotard today!